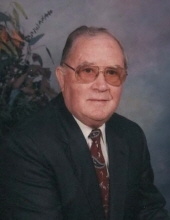 Leon Schaal, 90, of Altamont, died at 6:02 a.m., Friday, February 8, 2019 at Lutheran Care Center, Altamont. Funeral services will be at 10:30 a.m., Wednesday, February 13, 2019, at Immanuel Lutheran Church, Altamont with Rev. Bernard Ross officiating. Burial will follow at St. Peter Cemetery, St. Peter with military rites by Gieseking-Schwertdfeger VFW Post #7676. Visitation will be Tuesday, February 12, 2019, from 4-7 p.m. and for one hour prior to the funeral at Immanuel Lutheran Church. Memorials may be made to Bethesda Children’s Home, Lutheran Care Center, or Immanuel Lutheran Church. Gieseking Funeral Home, Altamont, is assisting the family with arrangements. Leon D. Schaal was born Monday, December 31, 1928 in St. Peter to Edward F. and Linda F. (Knecht) Schaal. He was the co-owner of S&W supermarket in Altamont for many years. He was a member of Immanuel Lutheran Church, a veteran of the Korean War; life member of Gieseking-Schwertdfeger VFW Post #7676, Altamont, and American Legion Post #380, St. Peter. He is survived by; his brothers, Merle Schaal, St. Peter and Laverne Schaal, Mattoon; his sisters, Lorraine Sasse, Lincoln and Phyllis Lynch (Jerry) Aurora Grande, California; long time friends, Jerry White and Leo Kruenegel; extended family, Kenny, Kim, and Kirk Kruenegel, and Benton and Anna White; as well as many nieces, nephews, and friends. He is preceded in death by; his parents; brother, Marvin in infancy, his sisters-in-law, Doris and Patricia Schaal; his brother-in-law, Harold Sasse; and nephew, Lee Lynch. Family wishes to extend a special thanks to the Lutheran Care Center staff for their exceptional care. To send flowers or a remembrance gift to the family of Leon D. Schaal, please visit our Tribute Store. "Email Address" would like to share the life celebration of Leon D. Schaal. Click on the "link" to go to share a favorite memory or leave a condolence message for the family.